"Gingerbread" redirects here. For more uses, see Gingerbread (disambiguation). The Gingerbread Mouse is an Event Mouse found during the annual Great Winter Hunt event. Cheese: See current Great Winter Hunt location Charm: ?? Have you ever noticed a gingerbread cookie that you didn't remember baking, just casually hanging out on your counter like it ain't no thang? Well, that's not the gingerbread man trying to be sneaky, it's the Gingerbread Mouse! This portly little guy isn't actually made of gingerbread, he just dresses up like gingerbread cookies and sneaks into houses so he can eat gingerbread. From every cookie eaten, he takes a small decoration and adds it to his costume, becoming ever more convincing with every snack. Information on how to locate and capture the Gingerbread Mouse can be found on the current Great Winter Hunt location page. 10 December 2012: The Gingerbread Mouse was released as part of the Great Winter Hunt 2012 event. However, the mouse was "locked" and unavailable to be caught by Hunters. 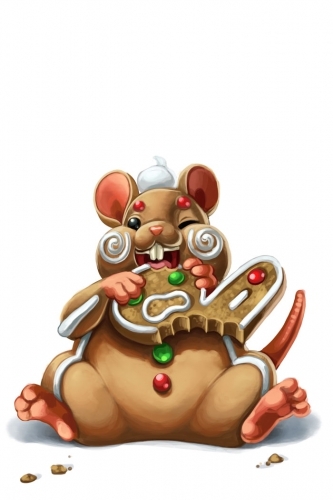 17 December 2012: The Gingerbread Mouse was "unlocked" and Hunters were then able to attract and capture it. 13 December 2016: The points for Gingerbread Mouse were changed. This page was last edited on 18 December 2017, at 16:57.